We know as organic architecture all the architectonical manifestations that aim at adequate and ally to the nitre. This idea can be found long ago in History but the master in the formulation of its principles was Frank Lloyd Wright. Organicist architecture is defined by the sense of the interior as a reality; the free plan as flexible and a way of allowing the continuity of atmospheres; the unity between interior and exterior; the use of natural materials; the house as a place for shelter. With Wright the Rationalism begins to be forgotten and new ways for architecture are opened. This American born architect travelled to Tokyo where he was fascinated by the Japanese architecture. Other of the influences that can be noticed in his work is that of Maya temples of Yucatan. Due to these varied influenced we can say that Wright had a cosmopolitan formation. His beginnings are associated to the Chicago School but soon he started developing his own style, in which we can distinguish different periods. One of these is that of Prairie Houses, a first attempt to put into practice his idea of Organic architecture. These simple structures consist of functional spaces, light and integrated with nature, at the same time that they are isolated enough as to guarantee the intimacy of their inhabitants. The houses are frequently built in different levels, and always a bit separated from the floor, as in Japanese architecture. One of the most famous houses is the Robbie House. He continued developing public and private buildings where he continued applying his building philosophy. One of the most representative of his works is the Falling Water House, in Pennsylvania. With this house Wright managed to integrate completely nature and architecture. The different terraces offer the possibility of building in different levels and glass dissolve the walls so interior and exterior and in permanent relation. He used different kind of materials, with an important role of stone that combine with glass and concrete. 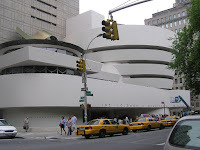 In other project Wright experimented with curve forms, as in the New York Guggenheim Museum. He wanted the museum to have well lighted spaces with controlled light that was not reflected in the surfaces. At the same time, he designed the building to offer a possibility of walking up on a ramp in a continuous way, without any braking element for the exhibition of the works of art. After Wright the word that can define architecture is diversity. One of the most representative architects of the 50s is the Finnish Alvar Aalto. His works are imbued by rationalist spirit but he mixed it with popular tradition and local materials, mainly wood, so common in his native region. His buildings are warm and thought to be appropriate for human beings and the dimension of human body, something in which Wright influence can be noticed. Aalto’s mature work embodies a unique functionalist/expressionist and human style, successfully applied to libraries, civic centres, churches, and housing. Although Aalto borrowed from the International Style, he utilized texture, colour and structure in creative new ways. He refined the generic examples of modern architecture that existed in most of Europe. His designs were particularly significant because of their response to site, material and form.